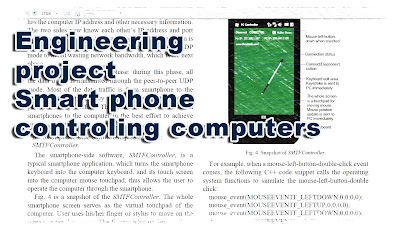 ECE / CSE Projects: Smart phones as computer’s remote control. ~ Engineering projects ideas for final year students & paper presentations collection blog. 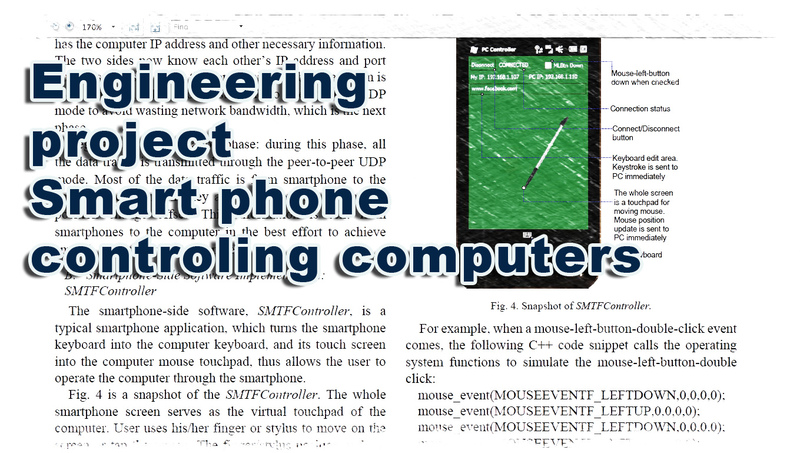 ECE / CSE Projects: Smart phones as computer’s remote control. This project is all about converting your smartphone into the remote of your computer wirelessly. There exist several situations where we want to wirelessly and comfortably operate a computer, where the computer screen is projected onto a big screen through a projector or big-screen television, such as classrooms, conference/meeting rooms, mobile, workgroup project environments and modern office environments, and even living rooms This project will eliminate most of the discomforts we experience in places like conference rooms class rooms and in places where presentations are given by projecting computers. The main idea behind this system is that it makes use of the smartphone as the mouse of the computer being projected though there are several specifically designed devices are available on the market for the purpose of operating computers remotely and wirelessly. Wireless keyboard, uses either Bluetooth or wireless USB mini-receiver plugged into the USB port of computer for the communication between the keyboard and the computer. Some wireless keyboards have a touchpad for controlling the mouse cursor. Wireless presentation controller, allows user to operate his/her computer remotely for PowerPoint presentation through Bluetooth connection. It usually has several buttons, including mouse-left, mouse-right, next slide and previous slide buttons (for PPT presentation), and even a small size rectangle touchpad for moving mouse cursor. However, all those devices have certain drawbacks. Wireless keyboard has limited flexibility and is not Manuscript received June 2, 2012; revised July 1, 2012. Whereas wireless presentation controller ensures its convenient for the presenter to carry around the place while presenting, which is not in the case of a wireless keyboard, apart from that it also doesn’t allow the presenter to have a complete control of the computer where as this device does have good mobility allow user to have full operation on the computer, such as running a program, moving or closing an application window, etc. Even it has a small touchpad for moving mouse cursor however it is very difficult for the presenter to use it to move the mouse cursor while he/she is walking around. There is also a draw back with such devices where we can connect only one such device to the computer if suppose the session is an interactive one and the audience also want to connect to the computer to ask question means it’s not possible. This imposes inconvenience when a group of people, such as a project team or a company internal meeting attendees, are having discussion and need to interact with each other through the same computer with its screen projected onto a wall. Small physical size for excellent mobility. They are designed for handholding and carrying around. They are owned and operated by individuals. Good Human-Computer-Interface. They have a small touch screen, a build-in physical keyboard or soft keyboard, and run a simplified modern operating system with good graphics user interface. Strong network capability, such as Wi-Fi wireless and Bluetooth allowing Internet access.